For the first time in seventeen years, our Tanglewood season got underway with James Taylor and his All-Star Band, instead of with Garrison Keillor and A Prairie Home Companion. During Keillor’s run, which began in the last days of the Clinton Administration and ended at the same point in Obama’s, one could always count on a refreshing dose of patriotism, particularly during pre- and post-show singalongs. James Taylor and his All-Star Band play tanglewood, July 4, 2017; Hilary Scott photo. 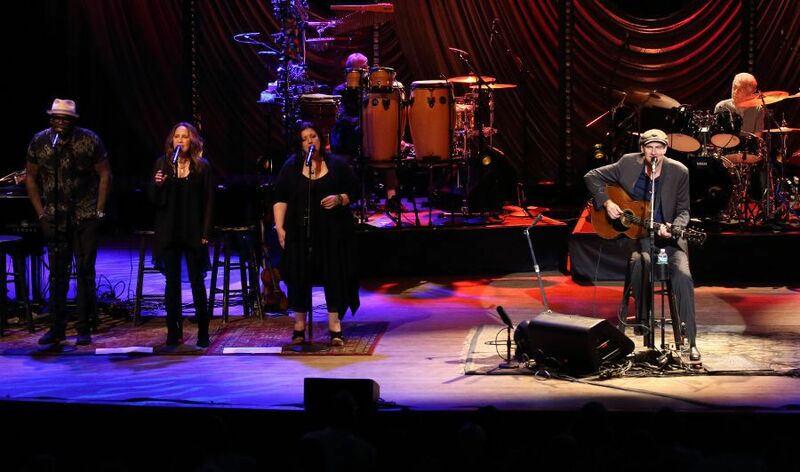 James Taylor delivered our dose this year, when he opened his July 4th show with a plaintive rendition of the Star Spangled Banner, which had the vast lawn audience on its feet, maybe not at attention, but clearly sharing a moment of quiet reflection. It was nice and easy, in typical James Taylor fashion, no polemics, just a respectful reading of the anthem of the nation that remains mankind’s best chance for a fully realized life. Followed immediately by another in a long line of outstanding rock n’ roll performances by Taylor and his band, nearly annual events here since the millenium. It’s not unusual for him to have a special musical guest in tow, from Taylor Swift to Carole King, and this time Bonnie Raitt took the stage for a couple of numbers, including a searing, soaring rendition of Johnny B.Goode, the anthem of the nation of rock ‘n roll, written by founding father Chuck Berry, who died in March. Another perspective of Keillor’s Tanglewood run is that it opened during the Music Directorship of Seiji Ozawa, spanned James Levine’s, and concluded during Andris Nelsons’, who returned to the Koussevitsky Music Shed July 7th to open the Boston Symphony Orchestra’s Tanglewood season with Mahler’s Symphony No. 2, Resurrection. In his third sason as Music Director, Meestro Nelsons stode purposely to the podium Friday night, following the slow, row-by-row assembling of the Tanglewood Festival Chorus on the risers behind the orchestra, cued the austere opening measures of the piece that will develop into an overwhelming, opulent musical experience. He is a compelling figure, marshalling the forces arrayed before him from the podium which he occupies with a deliberateness not seen from dozens of oher conductors we’ve watched here. This performance was folllowed by several curtain-calls and an ovation that lasted ten minutes or more. Here is a link to the BSO’s video podcast on Mahler 2. To read a “detailed explanation of how Mahler’s Symphony No. 2 is a heart-shattering work of genius,” including video clips and animated gifs, follow this link. The BSO customarily sees to it that the opening night program is “Gala” worthy; beyond ticking off that box, this year they’ve also adorned the season with a sort of symmetry, since the season-closing Beethoven’s 9th is as thoroughly soul-stirring as the Mahler, both concluding with orchestral and choral paroxysms.